Pvt. 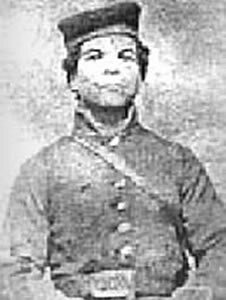 Reuben Bibb, of Labadie, Missouri, gained his freedom when he enrolled in the 65th Regiment, U.S. Colored Troops, and was mustered in at Washington, Missouri, on December 29, 1863. He was 45 years old when he enlisted. Missouri’s 65th Regiment is one of the “hard-luck” stories of the War. Assigned to garrison duty at Morganza and Port Hudson, Louisiana, fully 3/4th of its complement of troops (749 enlisted men and 6 officers) died of disease before their terms of service expired. Bibb died at Morganza on December 12, 1864.